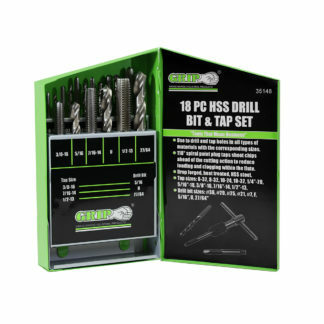 35148 GRIP 18 pc HSS Bit and Tap Set Tap Sizes: 6-32 to 1/2"-13 Drill Bit Sizes: No. 36 to 27/64" Description Use to drill and tap holes in all types of materials with the corresponding sizes. 118˚ spiral point plug taps shoot chips ahead of the cutting action to reduce loading and clogging within the flute. Drop forged, heat treated, HSS steel. Tap sizes: 6-32, 8-32, 10-24, 10-32, ¼”-20, 5/16”-18, 3/8”-16, 7/16”-14, ½”-13. Drill bit sizes: #36, #29, #25, #21, #7, F, 5/16”, U, 27/64”. Heavy duty metal storage case included.